First I’d like to say Thank You to Lego fans who donated or purchased and took part in this project. Without you, this would be impossible! This is the second year I have participated in the Creations for Charity international fundraiser project. 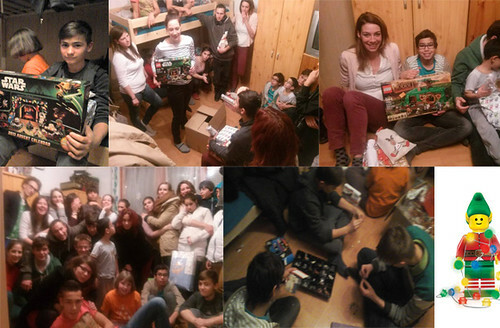 Last year we distributed the LEGO sets in the area of the capital city of Hungary, Budapest. This time I dreamed bigger. My plan was sending the LEGO and Duplo sets to children who are really in need and extreme poverty. Orphanages and institutes near the border usually have less money to buy or purchase presents for the children in Christmas time so I decided to transfer the LEGO sets there. We donated over $1,560 worth of sets. First I began with a short orientation than I found Bethlen Gábor foundation with an amazing volunteer crew called „the little people of hope”. This foundation focuses on helping children, who are living in poor conditions, lost their homes or have no family. With the help of this crew, the LEGO sets could find their best places. We distributed the sets among three children’s home in three township. Thanks to the kindness of the Lego fan community children had a different Christmas time in the Szent Mihány children’s home, in Hajdújárás Lurkóházak and in Szent Antal parish. Children who are living in orphanages or children’s home usually get used toys for present. In this Christmas, maybe for the first time, they spent hours playing with high quality unused LEGO sets. I hope we managed to give some special experience to lot of hungarian children who may didn’t have any LEGO sets until this Christmas. I work in a LEGO store, in Budapest, called Kockashop, so it wasn’t hard to find LEGO sets in a fortunate price. I could compile more than 70 Lego sets, Duplo products and minifigures. We distributed the sets between three children’s home where more than 100 children (3-18 years old) could play with them. It was a pleasure to experience how much help can we get from the community based on LEGO! 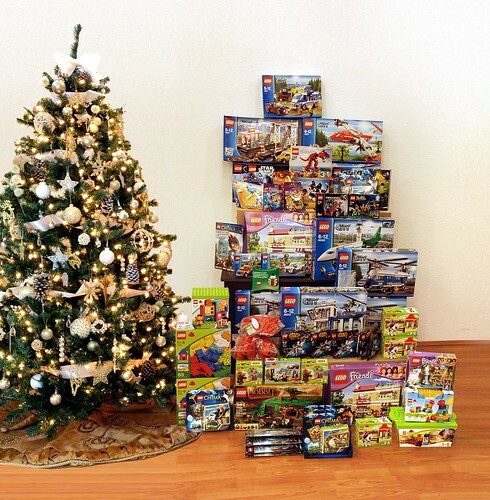 Thanks to the Brickworld, the BrickUniverse, the Bricklink, and the Beyond the brick crew, and last but not least to the Lego fans, it became possible to give LEGO sets to the hungarian children. Merry Christmas and thanks from Budapest! We would like to transmit happy reactions from more than 100 orphaned children’s on receiving their new LEGO sets. This is our first time being part of Creations for Charity. We were planning to do a charity project this year because our work and passion is to bring happiness with LEGO to children’s lives. Unfortunately it is very hard to organize a gathering in Hungary. When CfC wrote us back we couldn’t believe our eyes. This is the best Christmas project we’ve ever heard. Is there anything better in the children’s Christmas than getting LEGO for presents? We are a LEGO store in Budapest called Kockashop, so it was easy to purchase the sets in a fortunate price! We purchased with CfC’s help more than 60 sets! I decided to distribute the sets between three Children’s orphanages located in the Pilis Mountains in Hungary. We transferred the sets with the help of my friends in the Csepp a Tengerben organization who are also working for children. We were all very excited. These were maybe their first LEGO sets in their lives! We visited poor families too and gave them Duplo sets because in the orphanages the children were from 7 to 19 years old. So we helped young poor mothers to put Duplo under the Christmas tree. When the children got their LEGO presents they got so excited that they began to organize thematic Lego afternoons. The first was watching the Hobbit movie and playing with the Hobbit sets. I’m sure they will never forget this Christmas, and we will never forget your help! So thank you dear builders and everybody who donated or purchased LEGO items! You made Hungarian children’s Christmas more joyful! Without you, we wouldn’t have been able to do this! Merry Christmas and Happy New Year from Hungary!